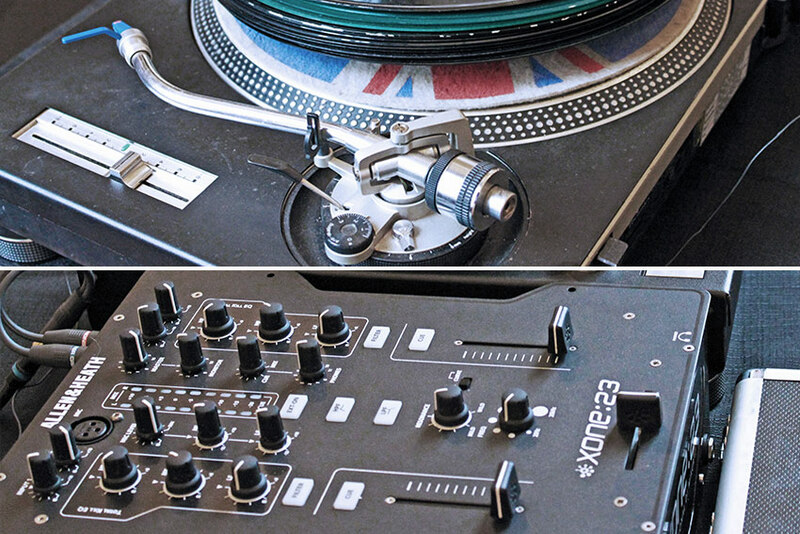 Normally, when I perform live I perform with one regular direct-drive turntable and a dj mixer that has basic EQs, the three EQs that limit the highs, because I work with frequencies, in order to compose. And then lately, since January, I’ve been using a double-headed needle that was gifted to me from the electronic producer King Britt, and these were prototypes made by a company in early 2000s. There are only 250 in existence. And in the early 2000s King Britt, along with dj Jazzy Jeff, and all these huge hip hop djs, were gifted these double-headed needles, but nobody knew what to do with them, because they were too abstract, so a lot of the djs didn’t’ use them, including King. And then, King and I met last year and he then was cleaning out his closet and he found the double-headed needle, and after that he texted me: «Give me your address», and I «What are you sending me?», and he «You will see». And I opened up the box and I saw these two needles on one head. So, when you place it on the record, it reads two different parts at the same time. And each needle has its own channel, so you can either play one song, or you can play both at the same time, and then from there you can play around with the EQs on both sides, on both channels. So you can really have a lot of fun with it. And then, when the needle is on the record, one needle is up and the other one is down. So then you have to put pressure on the one that’s up to get a signal. And so that helps to really creating different timing when one sound appears. So I slowly learnt how to use this stuff, the double-headed needle. I’ve always had one needle or a collection of broken needles that I had to switch out. And, you know, there’s a pause in time, whereas with the double-headed needle there’s no pause, I can go fluidly from one idea to another, which is mind-blowing. 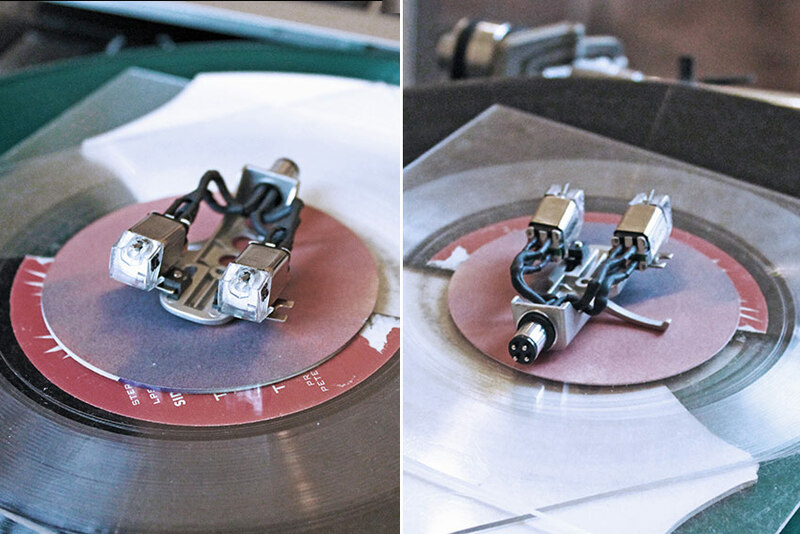 The needle itself, the company who produced it, used the Stanton needle body to develop this double-headed needle, so it’s blockier than an Ortofon needle that is more skinny and lighter. So, I hope one day someone can make a double needle with the Ortofon, because it’s easier to manipulate and move around, because it’s lighter whereas the regular chunky-blocky needles are heavier. 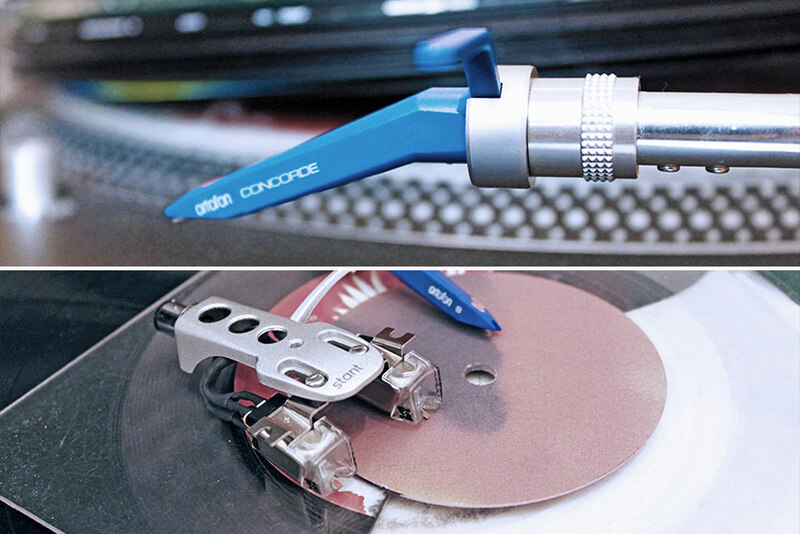 It’s not just graceful when you try to play with them, as an Ortofon dj has concord with the needle’s body shape. 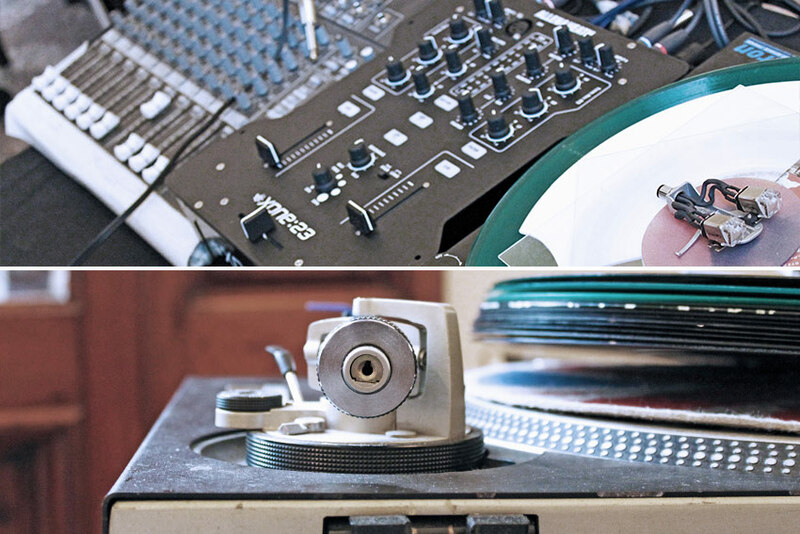 So, there are a lot of differences when you start thinking about needles in relationship with the kind of turntable that you’re using, in relationship with the kind of mixer that you have, and what you can do. And so then, when I’m on tour, I don’t have a lot of control outside and I just bring my needles, and I can’t bring turntables, I can’t bring mixers, they are too heavy, and my records are also too heavy! So I have to depend on people to find the turntable and the mixer that I need, in order for me to be able to perform. 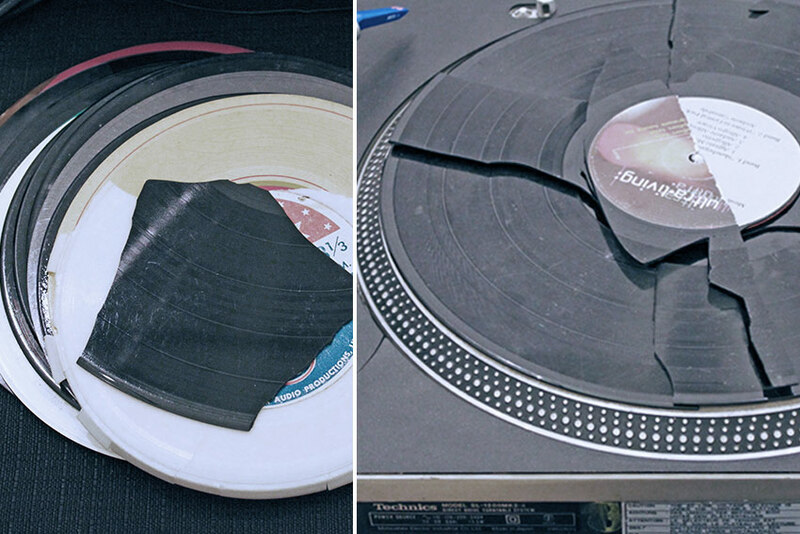 So, sometimes people will bring belt driven turntables, which is a literally large rubber band that’s connected to a motor and then the play is on top, and the rubber band is what creates the rotation. 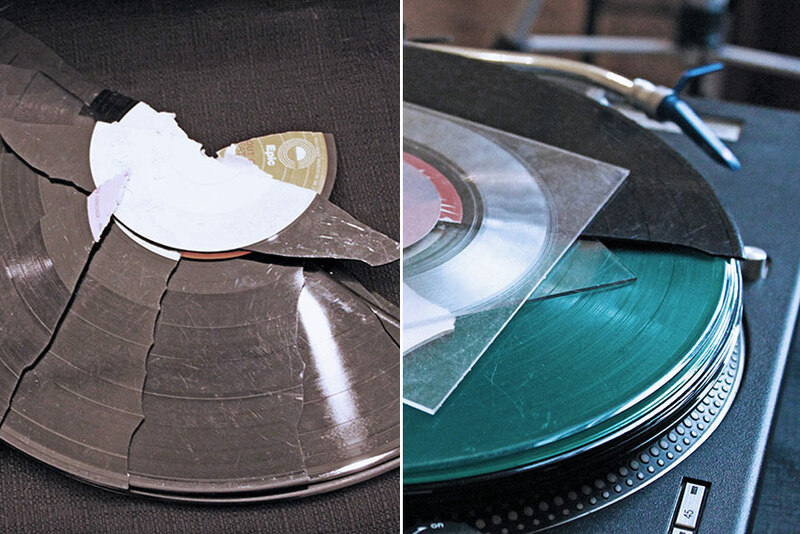 But with that, when you put backwards, there’s a lag time, whereas the direct-drive motor in the turntable, when you go back, it immediately snaps back forward, there’s no rubber band. A question about the records and the sound sources that you use: what in the way you produce sounds comes from the dj background and what from other, more abstract, experiences? Well, definitely my dj-ing and turntables are two different things. I don’t do hip hop turntables when I’m performing my turntables. Because hip-hop turntables to me are modern musique concrète: they are looking for samples, they want musical samples that are similar, that make rhythm, and then that are making a song. Whereas with me, I feel like I’m creating sound sculptures that are really more abstract sound ideas, rather than this need to make sounds musical. The only thing that makes it musical is that I’m on a motor and it’s rotating. So, of course, repetition is inherent, but that’s just what a circle is, you know, it just goes back around. The only thing that hip hop turntables and I have in common is that we’re on a turntable. And from there it’s really up to the viewer to decide if I belong with the hip hop djs or if I… don’t. Concerning the sound sources that I use, I have a few different methods: my favourite is when the records find me, because often people come to my performances with records to give me, or sometimes I have records dealers that have a record that they haven’t used and they just give it to me. I found that some of my best pieces that I improvised and created were with these records that I’ve never heard before. Normally, when I’m in a new city, I try to bring… if I do by my own records, what I do – my rule – is: “I’m not allowed to listen to them, after I buy them. It’s time to perform in front of people”. And then I tell them, I tell the audience: «Ok, this is my first time to hear this, and this is your first time. So, let’s hear it together». And then I improvise and make a sound piece. And we are all on the same page, we all don’t know what’s going to happen next! And I really love that, as a way of introducing myself to a new audience. So, when I do go into the records that I’m familiar with, it’s really easy and seamless to just create other pieces. So, records that I do precious are like flexible, are of like different flexible artists, or sound effects records. I also have sound effects records in Italian now! So, those are the kinds of records that I look for: records of speech, records that are no longer useful to the public but are useful to me, like sound effects radio records, and things like that. The kinds of records that people give me are so random: my favourite was when this kid came with a box full of records – these hand-cut records – from the Forties and Fifties (because at that time you could go into a booth and record yourself, like bringing your own guitar and you record, and then it comes out your own record in cardboard and thin). And so there were all these cardboard and thin… metals… one half-cuts of strangers and people from 1943, 1956, and it just says “Linda, on piano, 1943”. And it’s just this person playing piano and sounded so old, because it hasn’t’ been in a sleeve so the records of time, the scratches of time are there too and I mix them, and all sounds very ghostly. There was no other way for me to find these records, I feel like they came to me, like they wanted to be heard again, and so they found me. So, I really prefer that method of sourcing my records instead of me, because my ideas are not as good as other people’s are. Could you tell us something about your collaborations and future projects? Well, I normally perform solo. This year I’ve been focusing performing solo. 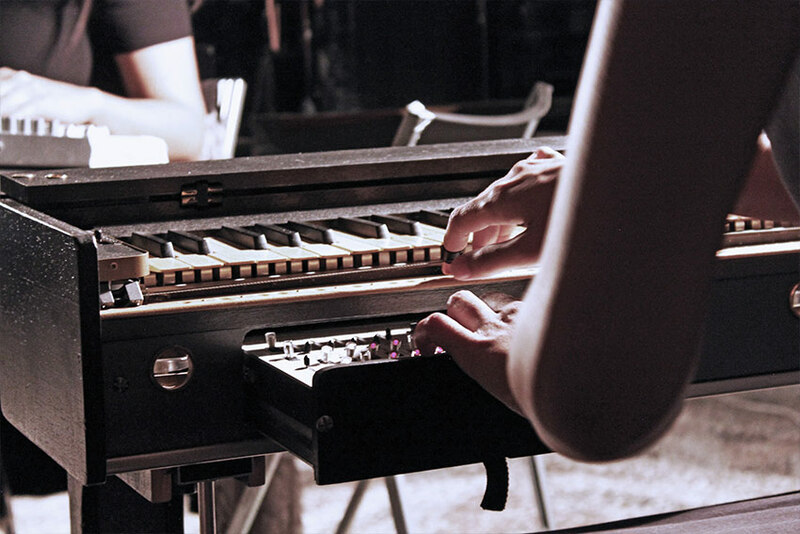 For tonight, when they suggested if I improvise with Nadia [Ratsimandresy, who plays the Ondes Martenot], I said «Sure, if the moment is asking I will say yes and see what happens!». 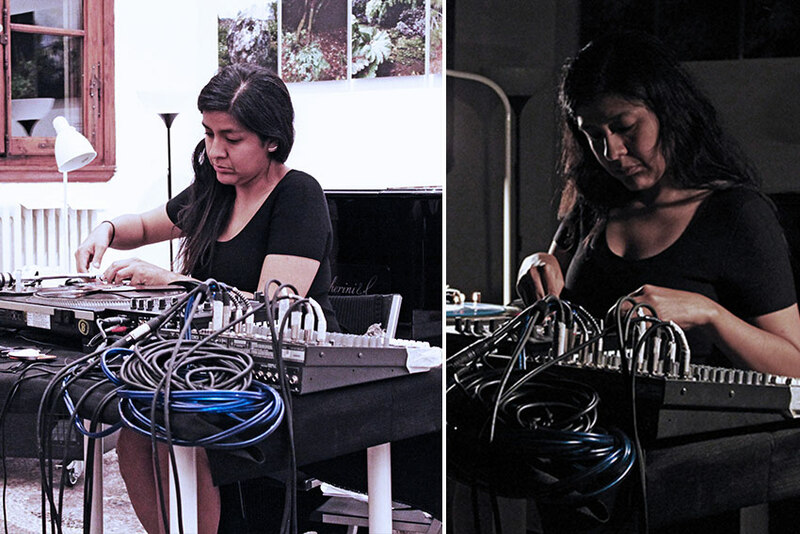 She is a brilliant electronic pianist and she’s very interesting as far as her aesthetic it concerns. I think it will be interesting but, as far as collaborating with other people, I decided to take at least a year break from it, because first I have the double-headed needle now, and I don’t want to collaborate with someone and still learn this thing. And also I just need some time alone, to redevelop, because I’m supposed to make an album. So, in that kind of re-shifted my expectations for the year, which was really great actually, I’m really glad that it happened, I deleted the album, which I’m really happy about… I think now the biggest focus is on the solo performing work, continuing the teach workshops on abstract turntables so more people can create some pieces from themselves, and of course writing a second version of my first book about abstract turntablism, that will be much bigger and focused on every technical aspect of the turntable in relationship to improvising with one turntable and also speaker configurations with improvising with one turntable. And so, I think that is a lot for this year! Along with all the touring and my residences, and of course showing my large skills on installation works for the museums and art galleries, because I have a few exhibitions coming up next year. I’ve been working on… I have a bunch of this anechoic chamber foam wedges that were used by an artist for an exhibition at the New Museum in New York a couple of months ago, and the New Museum was going to throw them out, and I just said «Can I have them?». Because each wedge is $100,00, and now I have 15 of them for free! And so, I’m making this sculptures with them now, and I really want some time to focus on developing my sculptural work. I just showed some sound sculptural work in Marfa (Texas), at the Donald Judd Foundation, and I really enjoyed the process of developing these sculptures that don’t need electricity to make sound. I’m really interested in sound installations that don’t depend on electricity, because then it’s something that can last forever, and that to me is really interesting, it’s super impossible to do, but I think that right now is a great time for me to really start to focus on that and develop a sculptural practice with different materials that can recreate this idea in one way or another. So now will be with these foam wedges, then from there… who knows?